At Bristol Harbour Festival last month I saw a performance that prompted smiles from everyone watching. 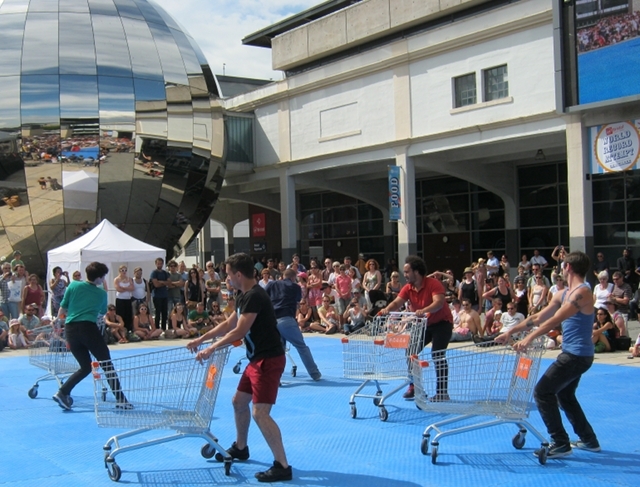 Created by C-12 Dance Theatre, Trolleys blends ballet, street dance, storytelling and humour using shopping trolleys less as props than as extensions of the dancers themselves. The dancers shared stories of rivalry, ostracism and love – all packed with energy, grace and excitement. For this week’s writing prompt I invite you to consider the humble shopping trolley as, if not a character in your story, then a crucial part – a home, a mode of transport, even a friend for your protagonist, and see where it takes you. This entry was posted in Writing prompts and tagged C-12 Dance Theatre, story ideas, writing inspiration by Judy. Bookmark the permalink.